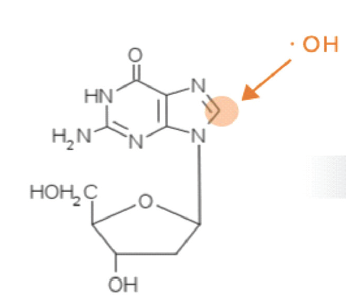 The ROS attack on the carbon in position eight of Gua oxidizes it into 8-OHGua and the non-oxidized nucleoside 2-dG into 8-OHdG. The study was carried out to demonstrate the relations between 8-OHGua, 8-OHdG, and the corresponding non-oxidized nucleoside 2-deoxy-guanosine (2-dG) with PD clinical progression. The measurements of 8-OHGua, 8-OHdG, and 2-dG were performed in urine samples of 198 PD subjects, ranked according to the Hoehn–Yahr scale (H–Y). The same analysis was also performed in a group of 33 subjects with other parkinsonisms. All markers were analyzed by using a high-performance liquid chromatography and electrochemical detection. For 8-OHGua, a new method was specifically optimized; the low limit of detection (10 ng/l) and good intra- and inter-assay coefficients of variation (2.2% and 3.6%, respectively), allowed reliable measurements of 8-OHGua in a wide range of concentrations (from 0.5 to 2,000 μg/l). Compared to the initial stages (H–Y < 2), 8-OHdG doubles in advanced ones (H–Y > 2) and 2-dG halves, both with statistical significance (p < 0.001). Furthermore, 8-OHdG increased more in males than in females, and its level was higher in parkinsonism than in PD. Even the values of 8-OHGua increased with the aggravation of the pathology, but in a less marked way and without statistical significance. The redox imbalance in PD causes oxidative damage on DNA that increases with the progression of the disease. By attributing to 8-OHdG the role of marker of extent of oxidative damage, to 8-OHGua the one of efficiency of removal of oxidized bases from DNA, and to 2-dG the one of recovery of native nucleosides for the replacement of oxidized ones, our data seem to show that the DNA repair mechanisms in PD are insufficient to counteract the chronic oxidative insult that characterizes the disease.